Insulated curing blankets can be used to maintain concrete temperatures at desired levels. 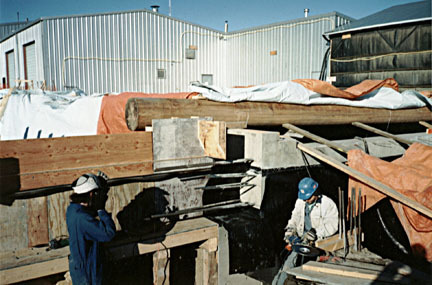 Concrete curing blankets are a light-weight and effective method of providing temporary insulation on project sites. The main use for curing blankets is to retain the heat in concrete when it is poured in winter. The blankets are placed on the freshly poured concrete until the concrete has a chance to cure. Blankets can also be used to put insulation wherever it is need on a construction site or to reduce heating costs when heat is being applied to a structure or work area. Concrete curing blankets are designed for use in horizontal applications. Use of curing blankets vertically or on scaffolding is not appropriate as the hems and grommets were not designed to take the loads needed. Layfield has over 35 years of experience fabricating custom tarpaulins. Debris net is a lightweight HDPE netting that is ideal for wrapping scaffolding. Layfield is a leading fabricator and distributor of hoarding tarpaulins manufactured from reinforced polyethylene materials.